In September of 2012, WKU PBS received an American Graduate initiative grant from the National Center for Media Engagement and the Corporation for Public Broadcasting to identify and implement solutions to the high school dropout crisis. The multi-year campaign is designed to raise awareness and start a national dialogue. WKU PBS partnered with representatives of the Bowling Green City and Warren County School systems, along with Big Brothers Big Sisters, Educational Talent Search, and the Why Try program to raise awareness and dialogue through local and national multiplatform programming. Locally, WKU PBS produced a pair of special edition OUTLOOK programs to shed light on the reality of keeping kids in school. 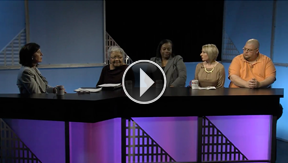 On April 6, 2013, WKU PBS held a Youth Media Training Summit in their studio with high school students from the Educational Talent Search who partnered with WKU student crew members to produce a series of video diaries documenting their decisions to stay in school. The thirty-second diaries will be used as interstitial material for broadcast on WKU PBS. The participating high school students will have access to video equipment to continue to document their stories. Explore more about the American Graduate initiative on Facebook, Twitter, or AmericanGraduate.org. Host Barbara Deeb welcomed input from a variety of sources working to keep kids in school. The diologue centers around identifying the dropout issue, targeting at-risk youngsters, and sharing community resources to make sure that all kids have the opportunity to receive a high school education. 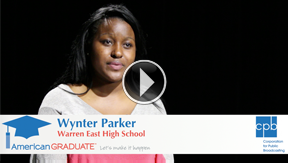 As part of a PBS American Graduate initiative, WKU PBS teamed up with members of the WKU Educational Talent Search to talk about curbing the high school dropout crisis, heres what they had to say: Wynter Parker from Warren East High School talks about the desire to have a better life through education. As part of a PBS American Graduate initiative, WKU PBS teamed up with members of the WKU Talent Search to talk about curbing the high school dropout crisis, heres what they had to say: Raymond Smith from Warren Central High School vows not to repeat the mistake his sister made by dropping out if school. As part of a PBS American Graduate initiative, WKU PBS teamed up with members of the WKU Talent Search to talk about curbing the high school dropout crisis, heres what they had to say: Tia Poole from Warren Crntral high School watched her mother struggle and is determined to make education her key to success.